Illinois Car Insurance Laws and Requirements | Hupy and Abraham, S.C.
How Much Car Insurance Do You Really Need in Illinois? Car insurance may keep you from financial ruin if you cause a car crash or if you are hurt by an uninsured or underinsured driver. Illinois law requires you to carry a minimum amount of insurance, but additional insurance may also be important for you to protect your assets and financial future if a car accident occurs. Illinois requires you to carry both liability insurance and uninsured/underinsured motorist coverage. $25,000 for an individual’s injuries in an accident. $50,000 for all injuries in an accident. $20,000 for property damage as a result of an accident. This is often expressed as 25/50/20 coverage. Of course, it is easy to see how damages from a serious accident can quickly exceed these minimums. Accordingly, it is important to purchase additional coverage to protect yourself in case of a crash. $25,000 per person and $50,000 in uninsured motorist coverage. This means that your own insurance company will pay up to these amounts for your bodily injury if you are hurt by a driver who does not have car insurance or in a hit-and-run accident. 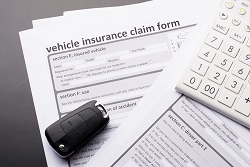 Underinsured motorist coverage may also be required for some drivers, depending on the other coverage amounts you elect on your insurance policy. Underinsured motorist coverage applies after the at fault driver’s insurance amount has been exhausted and until your bodily injury bills are paid or you hit the maximum amount of underinsured motorist coverage. If you are make an uninsured or underinsured motorist insurance claim, then your insurance company is now an adverse party and should be treated as such. As with any accident injury, it is important to consult a personal injury lawyer if you’ve been injured in an accident with an uninsured or underinsured driver. The insurance coverage levels described above are currently the ones required by the state of Illinois. However, if you have a loan on your vehicle then your lender may also require you to carry certain amount of collision coverage or comprehensive coverage to cover potential damage to your vehicle. Other optional coverages including rental reimbursement, medical payments, and towing are also available for purchase. When your policy is up for renewal, it is important to think about what would happen if you were in a catastrophic accident. It is hard to pay more money for something that you hope that you will never have to use. However, it is important to purchase coverage that will protect you if an accident does occur. To learn more, please read our FREE brochure, Understanding Auto Insurance, today. What Causes Illinois Car Crashes?